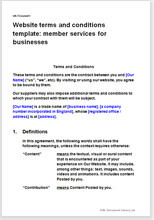 This template provides T&C for a website that offers a membership based service to businesses. You could charge a subscription or provide some or all of the services for free. Typically, member-based sites allow users a high level of interaction with the site, and with other members. This template includes extensive terms relating to acceptable use and removal of offensive content. These aim both to dissuade your members from misuse or malicious use of your site, and to give you additional protection from claims relating to the actions of, or content posted by, your members. This template has been written to cover international use because sites that would use such a template are likely to attract visitors from across the world. It has been written to comply with Indian law, but much is likely to be enforceable in many other legal jurisdictions as well. We have another very similar template if you operate a site that may be used by consumers (private individuals) as well as businesses. See Website terms & conditions template: membership based services. This document also contains paragraphs that provide intellectual property protection, both governing how your site content is used by your visitors and members and how information posted to your site by your visitors can be used by you.